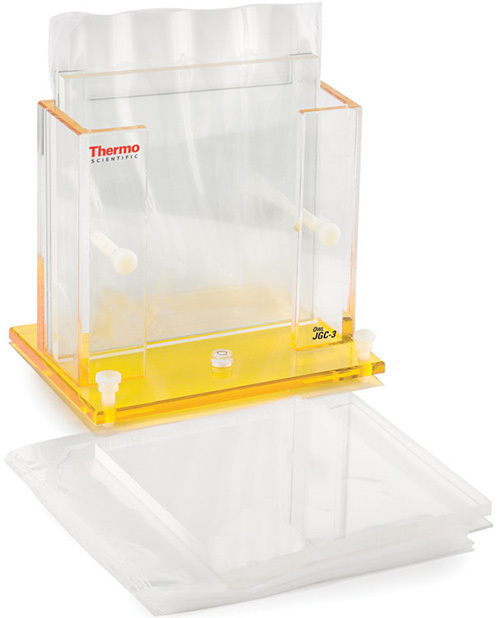 The Owl JGC-3 Gel Casting System offers a unique and novel way to cast polyacrylamide gels. A pouch is used to collect the excess polyacrylimide and seal the bottom of the gel. The "pouch" system eliminates the need for tape or bottom spacers. The design allows storage of gels without dehydration by adding buffer and heat sealing. Ships complete with Casting Stand, Blocking Plate, 3 Point Bubble Leveling Base, Spacer Placer, and 25 Gel Pouches. The system casts from 1 to 4 gels depending on the number of gels the researcher requires. Since there are so few moving parts the system will last for years of use and can be used in conjunction with competitive apparatus. It is easy, functional and designed for quick protein gel casting. Part Number P10-18G. The offset glass measures (W x L x H) 20 x 18 x 0.32 cm. Part Number P10-20G. The blank glass measures (W x L x H) 20 x 20 x 0.32 cm. Part Number P10-20R. Measures (W x L x H) 20 x 20 x 0.32 cm. Part Number P2-18G. Measures (W x L x H) 20 x 18 x 0.48 cm. Part Number P2-20FG. Measures (W x L x H) 20 x 20 x 0.48 cm. Part Number P2-20FR. Measures (W x L x H) 20 x 20 x 0.48 cm. Part Number P2-20G. Measures (W x L x H) 20 x 20 x 0.48 cm. Part Number P2-20R. Measures (W x L x H) 20 x 20 x 0.48 cm.